Tarot for Change: Cheat sheet - how to interpret Minor Arcana court cards? This post relates to the earlier Cheat Sheet - how to interpret Minor Arcana pip cards? Because court cards can only be understood and interpreted as a member of their suit (wands, swords, cups or pentacles), please refer to the linked post to check what the suits mean in tarot in case you're not yet familiar with them. The court cards can be read as energies or concepts but I personally always see them signifying people: either the reader him/herself or someone else influential or connected to the question. The court cards are a combination of their suit's meaning and the "job title" - the Page, the Knight, the Queen and the King. With the court cards, it's useful to flex your imagination to figure what each one of these court positions or "titles" meant in history. The court member roles originate from the Medieval era, but they also refer to the archetypal family: the daughter, the son, the mother, the father, and what sort or behaviour or traits could these roles encompass (in a stereotypical way). When court cards come up, they can mean either different people with the portrayed traits, or different personality aspects or behaviours of the same person. Also, men can come up as Queens (or Pages = daughters) and women as Kings (or Knights = sons), depending on their personality or behaviour. A page in the Medieval period was someone in training to become a knight. This tells a page is a young person learning something. In tarot, the Page normally means someone who is young or young-at-heart, or behaves in an "childish" manner. Note: childish can mean positive or negative things. A child can be innocent, curious, keen to learn, open-minded, flexible thinker, not stuck in a rut, happy-go-lucky, willing to try new things and imaginative. On the other hand, a child can be impatient, immature, inexperienced and inconsiderate. In tarot, Pages are also seen as messengers. The Pages are sometimes called the Daughter or the Princess of the suit, because Pages are seen as having traits that (in a stereotypical sense) girls/young women have: curiosity, creativity, sensitivity, artistic traits and a wish and skill to connect with other people in an emotional level. To figure out the meaning of each Page, you'll simply combine the "personality traits" of a Page in general with that particular Page's suit. The Fire Page, Page of Wands, is curious about the world of inner drive, passion, energy and excitement. What could be exciting? Newness, risks and adventure, for example. The Air Page, Page of Swords, is curious about the world of thought: words, word plays, sense of humour, communication, reading and writing, problem solving. But s/he's only learning, so the result can be great innovative insights or immature blunders. 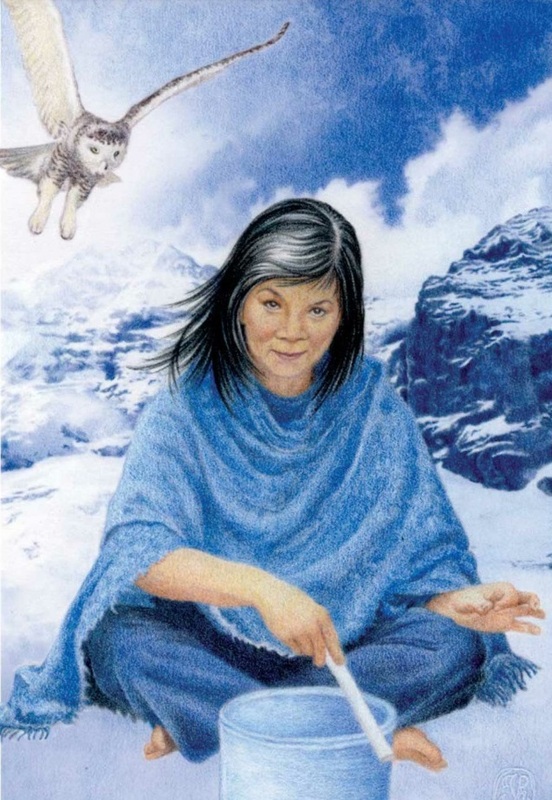 The Water Page, Page of Cups is drawn to the world of emotions: s/he likes to learn about and test the waters in the area of feelings, including being kind, innocent, sensitive, artistic and having a crush or falling in love. The Earth Page, Page of Pentacles is the learner of all things material: a new job, studies, apprenticeship; finding ways to earn money or come up with tentative business ideas; find new directions to invest money or source an income; or being creative for practical purposes. A knight in the Medieval times was the soldier, the guard, the protector and the champion of the royal family. Accordingly, the traits that Knights have in tarot are for example to: fight, protect, and explore/expand (the territories of their suit). The Knights are often portrayed as horsemen to indicate movement and pace: the Page walks by foot, so s/he can't go very far with his or her explorations. But the Knight can come and go as s/he pleases and cover vast distances - not just take tentative steps in the suit's energy but explore it. Knights are sometimes called the Sons or Princes of the suit because their traits are seen to be (the stereotypical) traits of boys and young men: adventurous, bold, keen to explore and conquer and/or protect. Depending on the suit, the Knights can be reliable or unreliable (dependable or rash), valiant, courageous or hot-headed like real life sons. The Knight of Wands is the explorer and fighter of the Fire suit, so s/he can be impatient, flighty, rash, fast, passionate and unreliable. The Knight of Swords is the soldier of the Air suit, so words and thoughts are his/her weapons: this knight can be quick to attack or defend him/herself, charge into action, dive into debates and act or speak before thinking. The Knight of Pentacles is the dutiful soldier of earthly matters: reliable and diligent worker, caretaker of finances, the accountant, and the ever-dependable - but maybe a bit dull - person who will not leave a duty undone. A queen in the Medieval times was the spouse of the king and not as high in authority (although some powerful queens exist in history, like Elizabeth I of England in the 1500s). However, the queens have always had indirect power as ruler-partners who advise and influence the king and inspire and nurture their people - they set an example for behaviour as the Mother of the Nation. Queens represent the archetypal personalities of women: wives, mothers, sisters, friends, home-makers, carers, nurturers; but also independent, powerful (business)women of today. The Queens represent the archetypal feminine energy or outlook in life combined with their suit's energy. Queen of Wands experiences and expresses life with passion, drive and creativity - she also knows how to express and enjoy her sexuality. Queen of Swords experiences and expresses thoughts and feelings by rationalising them, operating at the level of logic and analytical thought. Queen of Cups experiences and expresses her feelings at a purely emotional level, dwelling in them, showering them around, being the most (stereotypically) feminine of the Queens. Queen of Pentacles experiences and expresses her feelings from a pragmatic, down-to-earth point of view, by taking care of her family, home and business efficiently, but always with a warm touch. 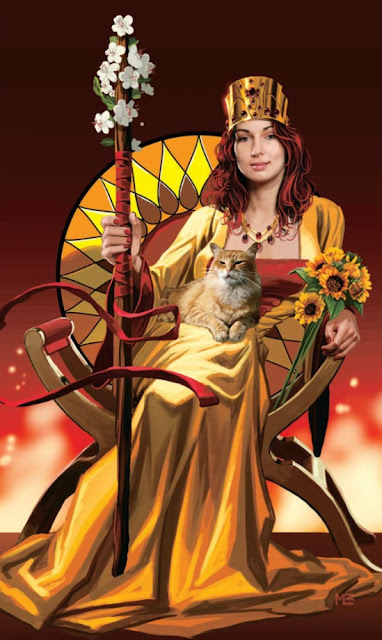 A highly informative, deeper post about the Queens is available here, Truly Teach Me Tarot. My favourite Queens, the Queen of Wands of the Witches Tarot deck and the Guardian of Air (Queen of Swords) of the Gaian Tarot deck. The fire queen above looks content, confident and relaxed surrounded by her favourite things and energising colours. The air queen below is a tribal wise woman with generations' worth of knowledge; a sought-after adviser for clarity and direction. A king in the Medieval times was the ultimate ruler, the head of the nation (the suit). Kings have full authority over their own actions and can influence or order other people, too. In tarot, the King is someone who has mastered the energy of the suit and can use its power externally: the King is able to use the suit's energy for his/her own benefit but also for the benefit of others to influence and empower - to rule in the world's fullest sense. The kings are also the archetypal representations of masculine traits: the protector, the ruler, the boss, the provider, the decision-maker. King of Wands is an energetic, enthusiastic and excited leader who is able to live his/her truth, be authentic, and inspire and influence others to be their best selves. This King is also passionate and sexual, as per his fire suit. King of Swords is the master of analytical thought: think of a mindset of an engineer or an analyst. He'll cut through any confusion and will find and present the core of the issue with absolute clarity. He is also convincing and logical in communication. He makes decisions based on rational thought and will not be swayed by emotions. 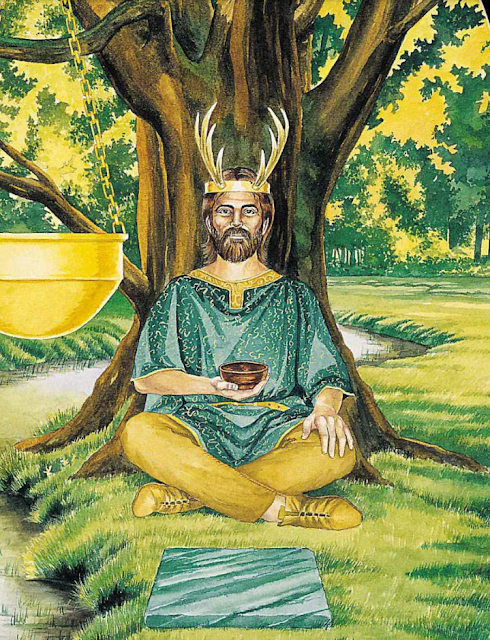 King of Cups is the master of his own and others' emotions: he's mature and wise, and he's an excellent counsellor. He knows how to be quietly and warmly supportive as a friend, boss, spouse or a relative. King of Pentacles is sometimes dubbed the "husband" card in the archetypal sense: he's the caretaker, provider, traditional leader who relies on common sense and good money management. He's pragmatic, organised and steady. Again, a handy intro to the Kings is presented at Truly Teach Me Tarot. And, again, both men and women can come up as Queens or Kings: the cards show personality traits and behaviour, not solely or always the physical gender of the person. My favourite Kings: the Grail King (King of Cups) of the Arthurian Tarot deck, and the King of Wands of the Joie de Vivre deck. The water king above captures the maturity and wisdom of the King of Cups (a respected shaman in tune with nature, spirits and human nature) and the fire king below is having fun, being fully and unapologetically himself. 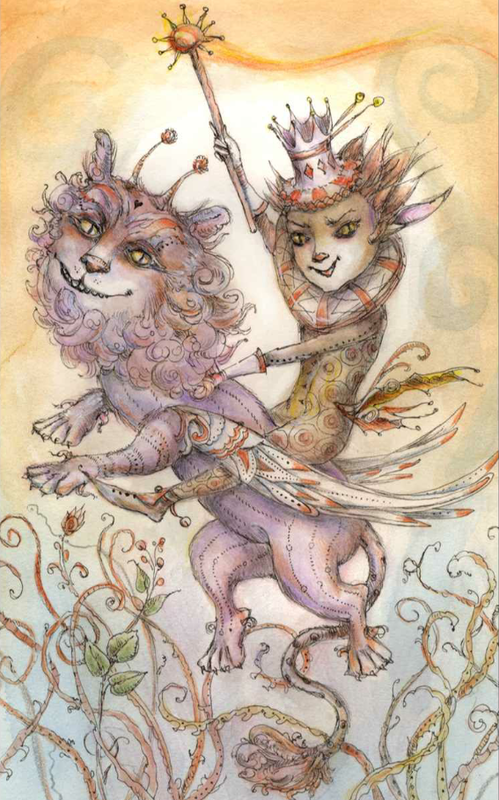 I always see this card as the King and Queen of Wands having a laugh and play around - passionate and enthusiastic as they are - but according to Pauline Cassidy, the creator of the deck, the King is riding on his trustworthy steed. If the court card pops out reversed (upside down), it can mean that the personality traits associated with the card are from the negative end of the spectrum. Instead of curious and open-minded, the Pages can be childish and bickering. Instead of bold and strong, the Knights can be inconsiderate and unreliable. Instead of supportive and emotionally confident, the Queens can be manipulative or bitchy. Instead of showing true leadership, the Kings can be repressing and controlling. However, nothing in tarot is black and white, so always take into consideration the question, the surrounding cards and your own intuitive hunches of the matter at hand.